Planning is crucial for practicing minimum impact usage. It is the foundation for any trip or outing. A well planned trip covers all aspects of the trip and anticipates any problems that might arise. In 2004 my wife, teenage daughter, and I went on a backpacking trip in western Colorado. We arrived at the trailhead in the afternoon. Originally we planned to start the trip the next day, but we were there so why not hike in part of the way instead of waiting until morning. Soon we had gear strewn throughout the parking area of the trailhead. We had planned for the trip, but basically our plans were just an itinerary. Hastily packing, our packs grew heavy. Finally we locked the car and headed toward our destination. The monster packs slowed our progress to a crawl. Consulting the map we tried to determine where we could spend the night. As darkness approached, we were still hiking, looking for any place to pitch a tent. The trail we were hiking was probably an old mining road cut into the slope. It gave us a creek on one side and a steep slope on the other. There was no flat land to be found. to make matters worse, our daughter was not having fun and for that matter neither were we. Finally, we were out of options. we had pushed until we could not go one step further. At a slightly wider section on the trail we stopped and set up the tent on the trail. It was a hardened surface and we didn't see how we could do any more damage to area, but we still were sleeping on the trail. For our punishment, we spent a sleepless night. The roar of the creek left us hearing strange noises that we thought were hikers trying to get around our tent. At dawn, we quickly packed and continued our hike. We didn't want anyone to see us. It was more than a mile to a suitable camping spot. There was no way we would have made it to that location the night before. Due to bad planning, we had a terrible day one of our trip. By starting in the afternoon we had hoped to make the trip easier, but instead it was harder physically and mentally. We still tried to practice minimum impact usage, but when you are camped in the middle of a trail, well you just look guilty! (see Summer Stories - Sleeping on the Trail for a similar story). The first step for trip planning is to establish goals. Are you trying to break a record for hiking the Appalachian Trail, or just go for an easy stroll along a trail? Chose a destination. If you know someone that has been to the destination, try to obtain first hand information from them. Other sources include guide books (library) or online information. Some folks like to ask questions on forums. (cloudhiking is our map and adventure guide site). Taking a picture of guide book pages with a smart phone is an easy way to carry the information on the trip with you. 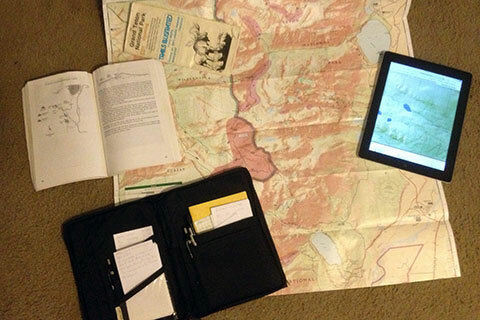 With the destination set, plan an itinerary. How many days or hours is the trip will the trip last. Naturally, the longer the trip the more involved the planning becomes. Check the Park, Forest, or Wilderness Area web sites for updated information on the destination. Know the rules. The more members of the group that are involved in the planning, the better the plans are. Remember, the group is only as fast and/or strong as the slowest and/or weakest members. Plan the gear and food. Coordinate the gear selections so that items are not duplicated. Choose food that everyone in the cook group will eat. You don't want any leftovers. Set standards for cooking, personal hygiene, dish cleaning, food disposal, trash, potty breaks, and bear (or other wildlife) avoidance. Special gear might be needed to meet some standards. Agree on hiking styles - when to take breaks, speed, etc. All standards should fulfill the simple guideline - do not damage the land. Seldom do we go on a trip that everything happens as planned. Be prepared with alternatives. On most trips we plan for "what ifs". With time, the "what ifs" have all seemed to have come to pass, no matter how crazy they once seemed. Train to meet the physical requirements of the trip. It is easy to plan to walk 25 miles each day, carrying a forty pound pack, for ten days in a row, but when the feet hit the trail, most folks quickly find that their eyes deceived them while looking at the buffet of adventure. Training applies to all activities, not just hiking. Make notes to help you better prepare for the next trip. Share your information with others. Planning heightens the anticipation for the trip. Always plan for minimum impact usage.